The following remote observing report is from Alexandrea Safiq, a freshman at Union College. and Engineering is a stark reminder. 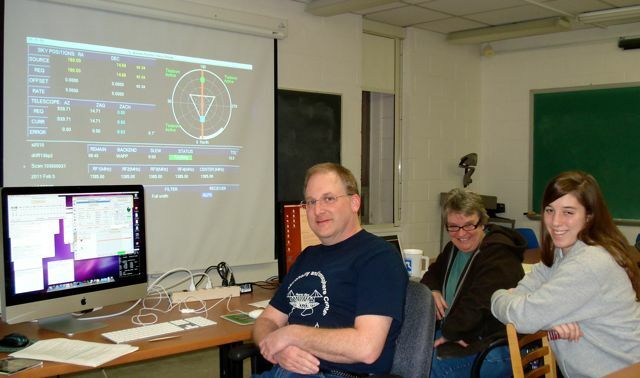 Alex & Lucas controlling the Arecibo radio telescope from Union College. freshmen physics seminar where they did ALFALFA-related projects. Remote observing from St. Lawrence! Jeff Miller from St. Lawrence here. Aileen O’Donoghue, Heather Cutler ’12 and myself are experiencing our first remote observing session! It was a bit nerve wracking at first when things didn’t work as expected, but Martha talked us down. We’re directing the collection of photons from 44°36’N, 75°10’W. It’s a balmy 22°F here in the North Country – practically shorts weather! And we have the sounds of the coqui emanating from my laptop. What more could you ask for?